But while Guthrie paid tribute to those that died that day outside Coalinga, California, the details surrounding what really happened that chilly January day tells a much sadder tale of misfortune and poor judgment. Airline Transport Carriers was an airline service, incorporated in the State of California by Charles & Edna Sherman. They had previously operated Fireball Air Lines of Long Beach, in 1946, with its main offices at the Lockheed Air Terminal at the Burbank Airport. Airline Transport Carriers was also the parent company of California Hawaiian Airlines and California Central Airline. Airline Transport Carriers operated under an irregular air carrier letter of registration, issued by the Civil Aeronautics Board. A non-scheduled air carrier, used to unusual jobs, the flight on the morning of January 28th, 1948, was no exception. The airplane would be carrying 28 Mexicans nationals. Bound for the Imperial County Airport, the flight was part of a contract that Airline Transport Carriers had with the United States Immigration & Naturalization Service (INS) to fly deportees, usually agricultural workers whom entered the country illegally, or overstayed their work permits, to border towns near Mexico. Captain Francis C. Atkinson, of Long Beach, California, was pilot of the aircraft that morning. The 30-year-old had logged more than 1,700 hours flying time during World War II as a member of the Air Transport Command, flying the China-Burma-India "hump" in the Pacific theatre. It was also to be one of his last flights for Airline Transport Carriers, as he had just been recalled to active duty. Atkinson's wife, Bobbie, was the flight stewardess. The co-pilot, Marion H. Ewing, had over 4,000 hours of flight time, some of which was earned also flying the Hump, he had once been a flight instructor, but having operated a delicatessen in Newport Beach after the end of the war, had re-entered the world of aviation only four months earlier. Originally slated to fly a different DC-3 (which was properly certificated for 32 passengers), Atkinson and his flight crew took the wrong airplane to Oakland from Burbank. The DC-3 which they flew, NC36480, was only outfitted to carry 26 passengers, and was 7 flight hours overdue for a routine, but required, safety inspection. The flight from Burbank to Oakland was uneventful. However, once in Oakland, things started to go downhill. The twenty-eight passengers boarded the DC-3, along with their INS guard, Frank E. Chaffin, 53, who had been a soldier in World War I, and served 20 years with the INS. He was assigned to watch over the deportees to their final destination, the INS Deportation Center in El Centro, California. Three of the passengers would be seated on the luggage the plane carried. But the additional passengers also placed the aircraft's weight over its takeoff limits by 67 pounds. In the end, this would have no effect, but it was a clue into the state of mind of the pilot and flight crew. One hour and 35 minutes after the aircraft had departed from Oakland, it was observed flying over the hills east of Coalinga, California, cruising at an estimated altitude of 5,000 feet above the ground. At the same time, a trail of white vapor, 150 to 200 feet long, was observed streaming from the left engine of the aircraft. Ten to 15 seconds later, flames were then seen flowing from the left engine over the wing and back to the tail. Witnesses on the ground claim to have seen several people jump from the doomed airliner when, seconds later, the left wing broke free from the fuselage, and the airplane fell to earth, crashing in a spectacular fireball in Los Gatos Canyon, killing all aboard. 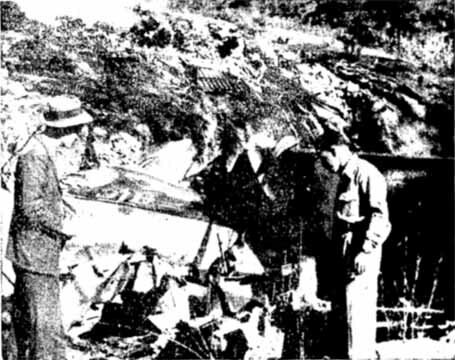 The plane crashed about a mile east of the Fresno County Industrial Road Camp, a work camp for convicts. Mel Willmurth, a superintendent at the camp, dispatched inmates to help put out the ground fire started by the crash. "While I was trying to get (phone) connections," Willmurth said, "I could hear the boys shouting. 'Here it comes.' One cried, 'it's going to land in the yard.' I didn't know whether to crawl under my desk or run. However, I figured from the position of.the plane when I saw it that it couldn't fall too close, so I kept on with my calls." On their way to the scene, the prisoners came across strewn luggage, and bodies, some still strapped to their seats, littering the landscape. 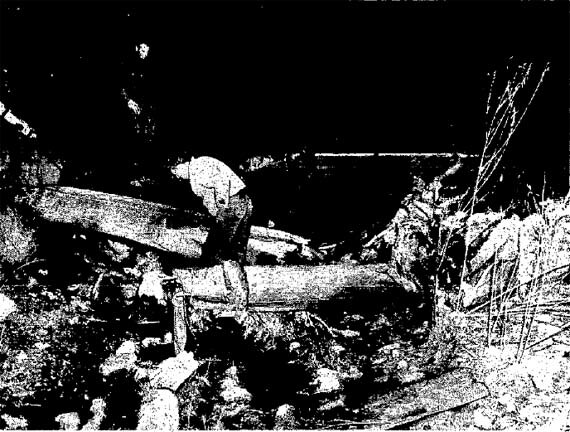 Fire destroyed much of the wreckage, and the many of the bodies of the crash's victims were impossible to positively identify. Among those passengers whose remains were identified were: Ramon Perez, Jesus Santos, Ramon Portello, James A. Guardaho, Guadalupe Ramirez, Julio Barron, Jose Macias, Martin Navarro, Apolonio Placentia, Santiago Elisandro, Salvadore Sandoval and Manuel Calderon. Among the passengers for whom remains were never identified: Francisco Duran, Rosalio Estrado, Bernabe Garcia, Severo Lara, Elias Macias, Tomas Marquez, Louis Medina, Manuel Merino, Luis Mirando, Ygnacio Navarro, Roman Ochoa, Alberto Raygoza, Guadalupe Rodriquez, Maria Rodriguez, and Juan Ruiz. The investigation of the mishap, started immediately after the crash was reported to the Civil Aeronautics Authority, found that the separating gasket in the left engine fuel pump showed signs of being fractured prior to the time of the last flight. The defect was, according to investigators, latent in character, and one which might not have been found during the course of a 100-hour inspection. However , the investigating board surmised that, during the flight, fuel escaping from the left engine-driven fuel pump caught fire, and due to 'slipstream effect' (the intense fire aircraft can encounter which is extremely hot due to air moving fast in-flight) burned through the wing panel, like a blow-torch, and continued through the spar of the left wing. The resulting damage broke the left wing off of the plane, a fireball ensued, and the plane crashed. Only 16 sets of remains, including the entire flight crew and INS guard, were identified. The remains of the 28 deportees were buried en masse at the Holy Cross Cemetery in Fresno. The U.S. government claimed no liability in the chartering of the airplane. Airline Transport Carriers would carry on after the mishap, as they were heavily insured, over the $100,000 required by law, but eventually they declared bankruptcy in 1953. Most, but not all, newspaper accounts of the crash omitted the names of the deportees aboard the aircraft. Woody Guthrie, the well-known songwriter of the era, took note of this deletion, and wrote a poem on the matter. A decade later, Martin Hoffman, a school teacher, added a simple melody to it, and Pete Seeger began singing it in concerts. Over the years, the song has been covered by numerous groups, including Nanci Griffith, Dolly Parton, Bruce Springsteen, the Kingston Trio, and The Byrds. As recently as 2005 the song was recorded by Joan Baez for her live album Bowery Songs. Click here to listen to a cover version of the song by "The Byrds"
Guthrie, always a champion for those he felt were getting a raw deal, questioned the absences of names for the deportees in the newspapers articles he read. He viewed it as some sort of racist, final cold act of an uncaring American public to those migrant workers killed in the crash. Keep in mind that unlike today, at the time the U.S. did have a guest worker program and entry into the U.S. from Mexico on a work visa was simply a matter of filling out a few forms. It was so easy that from 1942 to 1964 the Guest Worker program allowed 4.5 million Mexican farm workers to legally cross the border to work. So there was little excuse for being here illegally. It should also be noted that even today accidents with large numbers of people involved seldom list the names of all those killed and injured. Typically only the local newspapers will carry a complete passenger listing (as was done in this case), while other more distant newspapers will simply state something akin to, “28 were killed and 2 injured in a plane crash…” So what Guthrie saw as an injustice to those killed, was simply typical and standard newspaper reporting practice still in common use today. Another point is that while nobody today can know for sure, it is possible those taking the plane back home may have welcomed the two hour flight in lieu of the other option, a 14 hour plus bus trip. In fact, the INS gave the deportees the choice of air or ground travel. In all likelihood, for most of the passengers, this was their first time aboard an airplane and viewed by them as at least one good thing stemming from their deportation. But no matter how one looks at it, the accident, thanks largely to song, is remembered.